Businesses often require signatures on documents to signify knowledge, approval, acceptance or obligation. Printing the documents to have them signed is a common practice. Even businesses that automate the workflow in their office often print the final document to have it signed. If a business needs a document to be signed by someone who is not in the office, the business often sends the printed document by overnight delivery to have it signed. Now, however, businesses that are technically savvy are moving away from this process and using electronic signature solutions. There are several forms of electronic signatures. These include a scanned image of a handwritten signature, a signature indicated with the click of a mouse – such as in a checkbox, the “signature” that appears at the bottom of an email, “placing” a signature in a PDF document, and signing by using a finger or mouse to trace a signature onto the document. While all digital signatures are electronic, not all electronic signatures are digital. The electronic signature formats that are not digital present legal verification problems. 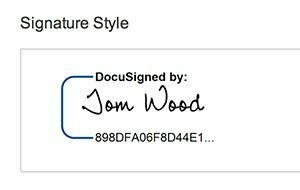 Some of the problems with these electronic signatures are that the image of the signature could have been copied from another document or another field on the same document, there is no proof as to when the document was signed, and the document could have been altered after it was signed. A digital signature is a more secure type of electronic signature that overcomes the legal verification problem. The signer is authenticated when the signer’s information is embedded into the document along with the date and time of the signature, linking the document with the signer’s identity. In addition, there is proof of data integrity because if the document is altered after being digitally signed, the signature becomes invalid and can’t be re-attached to the document. A digital signature is therefore legally enforceable in court. There are several secure cloud solutions for obtaining a digital signature. The documents are uploaded to the platform by your business and stored in PDF format. You customize the text fields, initials boxes, check boxes and drop-down menus, and assign one or more signature fields where the individual must sign the document. Individuals are notified by email that there is a document to be signed and each individual can e-sign the document from any location using any browser. Digital signatures simplify the signature process by reducing the time needed to print, send, revise and sign documents. These solutions also reduce the cost of paper-based processes by eliminating the need for printing, faxing, and overnighting documents. You can control who views the document, and see who has signed and who hasn’t yet signed the documents. Repetitive processes can be automated using reusable templates, and all documents ever signed for your business are stored in a central document storage. Vendors of digital solutions include Adobe EchoSign, DocuSign, RightSignature, SIGNiX, and e-SignLive by Silanis. Some of these provide e-signature apps for mobile devices (which can be used to create, send and sign documents) and some provide the option to sign with a signature pad in your office. Many solutions can be integrated with your business applications to prepopulate forms and control data that is collected. Plans include individual, small business and enterprise options, and documents can be branded with your logo to ensure that recipients identify the documents with your organization. If you would like to discuss how using digital signatures can improve your business processes, call us. Big Idea Technology will work with you to incorporate digital solutions into your workflow.